Pole pruners are a strange tool, with the cutting power of hand pruners but a reach of eight feet and more. You use them when you have small things to cut that you can’t reach. Really, unless you are a perfectionist that can’t stand to leave a little dead wood here and there on tall plants and vines, you won’t be using these very often at all, and may not need to buy one. However, if you do decide you need to make small cuts high overhead, owning pole pruners can save you uncomfortable work from a ladder. Here we’ll talk about some examples of times you might use pole pruners, and a few tips on how to use them safely and without tiring your hands more than you need to. Though easier and safer to use than its cousin the pole saw (since pruners can only cut much smaller wood), pole pruners must still be used cautiously. You are cutting smaller wood, but the wood bounces or sails around and falls less vertically than heavy wood. And you are looking up. No twig is so small that it can’t poke your eye. Never, ever, ever work near power lines, or on branches with any part above a power line. Make sure the head is drop-cast or die-forged metal, not the weaker steel. The kind that operates on a rope running to a bicycle chain is best. Fiberglass poles are 40% the weight of wood poles, and so are preferable. It is easy to find one with a telescoping option to lengthen between 7 and 14 feet long or so. Minor pruning on trees. Thinning the new growth at the edges of a mature tree is the supposed main job for pole pruners, but in practice, it is very slow work to do with pole pruners. If it weren’t, professional orchardists wouldn’t use such big ladders. Trunk cleanup. 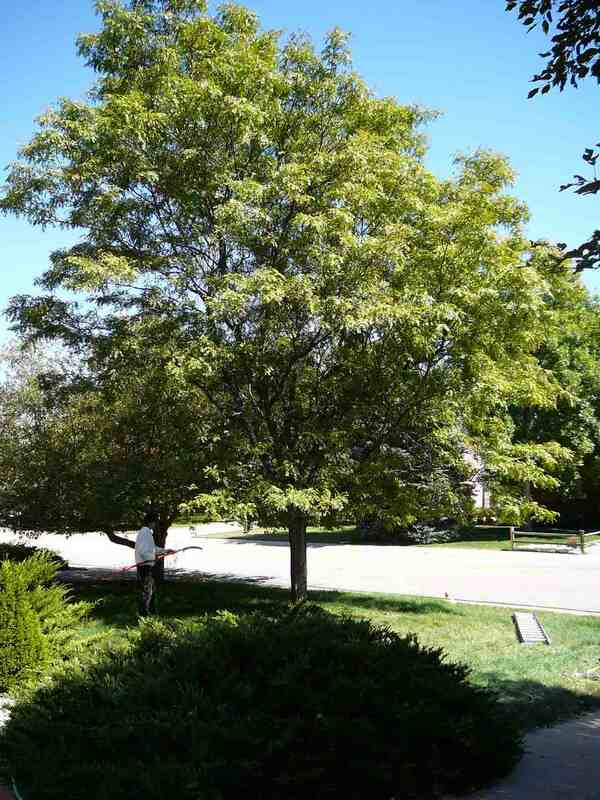 Mature trees will occasionally sprout epicormic growth from their trunks; honey locust especially likes to do this. Alternately, you may at times need to down pull all or part of a vine climbing a tree. Tidying high on trellises. When you need to tidy up climbers like clematis, trumpet creepers, and some roses you might like to use a pole pruner, though most of the time I think I’d find working from a ladder more comfortable. If you didn’t have a spotter to work with you, that would be another good reason to use pole pruners. If cutting a branch, stand off to one side not directly below it. If cutting small wood you can be below it, but don’t look up as you cut. Or wear safety goggles. Never a bad idea. Wear work gloves to prevent rope burn. Even cheap cotton gloves make a big difference. I like to loop the rope once around my palm and then close my fist over it before I cut. Now I get a strong pull without having to squeeze my hand to hold the rope tight. Don’t try to cut anything too large (over a half inch thick). You’ll be tempted to at times, and it won’t work, and embedding the blade in dense wood is no fun. It’s hard to pull out, and now you’ve left a gash in living wood. Cut much like you would cut with hand pruners, but don’t go nuts trying to cut precisely at a node every time; it’s just too hard. Get the twig deep into the crook of the pole pruner head where the cutting action takes place, then pull the rope to make your cut.